Skyler Bouchard (@nycdining) is a famous New York City foodie. With Halloween less than 2 weeks away, he has created a delicious cocktail – Halloween Sugar Cookie Shooter. Perfect for that outrageous Halloween party or a quiet social gathering. “Trick or Treat” is the popular saying around Halloween. This great tasting cocktail from Skyler is definitely a treat! Halloween is a great time to have fun. Get in the holiday spirit and wear your favorite Halloween costume and enjoy attending a party. An awesome cocktail is the hit of any social event. The Halloween Sugar Cookie Shooter is as delish as you can get. Baileys Original Irish Cream Liqueur, sugar cookies and vanilla ice cream. Doesn’t that sound amazing? * Rim shooter glass with honey and sugar cookie sprinkles. * Combine Baileys Original, vanilla ice cream and milk into blender. Blend well. * Pour contents into shooter glass. * Top and serve with Halloween sugar cookies. You can’t celebrate Halloween without a pumpkin. Most people carve and decorate their pumpkin in all types of styles and design. Pumpkin pie is also popular as a desert. But what about a pumpkin cocktail? Try a Pumpkin Spice and Everything Nice cocktail. It’s made with Baileys Pumpkin Spice, which is a new limited edition. As a result, it’s available only through the month of November. Add Captain Morgan rum as well as and vanilla ice cream, and its a cocktail to die for. The Halloween spirit lives on and this terrific tasting cocktail is also perfect for Thanksgiving. Here is the cocktail recipe created by New York City Mixologist Sarah Morrissey. * Combine Baileys Pumpkin Spice, Captain Morgan and vanilla ice cream in a highball glass. * Top with cola and stir. Garnish with mint sprig. 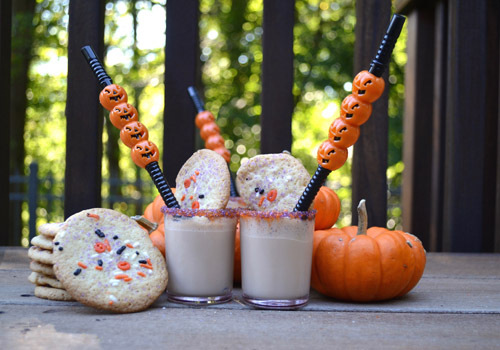 Make your Halloween party a success with a fun, seasonal cocktails like the Halloween Sugar Cookie Shooter and Pumpkin Spice and Everything Nice. Stop back and follow our popular luxury blog. Read about more delicious cocktails for any occasion.